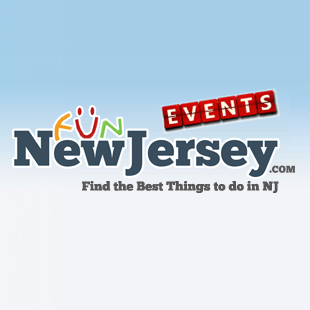 You may be hard-pressed to find a dog-hater in New Jersey. So many people in this state are obsessed with their pooches. 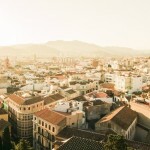 In fact, there are numerous restaurants throughout the state that allow you to bring your dog with you to enjoy your meal on their outdoor patio. Understanding what a restaurant means when they say they are “dog friendly” can also be tricky to decipher. Are they open to all sized dogs, or just the little guys? Do they only permit dogs on the patio, or are they allowed inside as well? To make matters simple, we have selected 25 restaurants in NJ that have perfectly explained their “dog friendly” policies, so you know exactly what to expect if you show up with your furry friend. These restaurants have a welcoming staff, friendly patrons and a casual atmosphere. Our list of dog-friendly restaurants provides a diverse choice from casual burger spots to beach-side picnic tables to upscale, gourmet restaurants. 1. Wonder Bar: Probably one of the most well-known dog-friendly establishments in Central NJ. 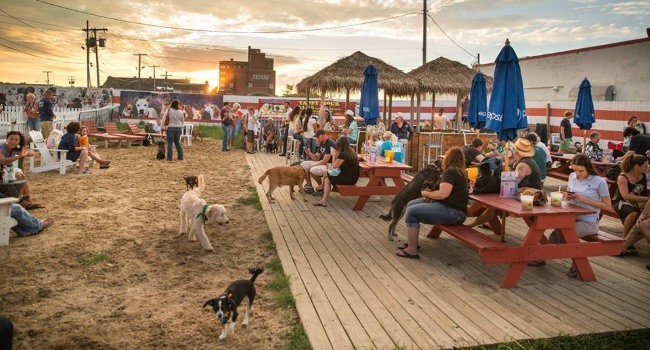 Wonder Bar in Asbury Park hosts regular Yappy Hour events where dog owners are welcome to bring their four-legged friends with them as they enjoy drinks down the Shore. This event usually starts at 4pm. All sized dogs are welcome on Thursdays, Saturdays and Sundays. On Fridays only small dogs are permitted. 2. 9th and Coles Tavern: Located in Jersey City, 9th and Coles Tavern is an upscale Northern NJ restaurant with outdoor seating that dogs are welcome to visit during seasonally appropriate months. This dog-friendly restaurant is open 6 days a week, closed on Sundays. They serve high quality American cuisine with extensive beer and wine menus. If you dine with them on Saturday, you can also enjoy their brunch options. 3. Harpoon Henry’s: Seasonal dog-friendly restaurant with both indoor and outdoor air conditioned seating. This Cape May County restaurant features three bars serving frozen drinks and impeccable sunset views of the Delaware Bay that are guaranteed to take away any stress you (or your dog) may have. 4. 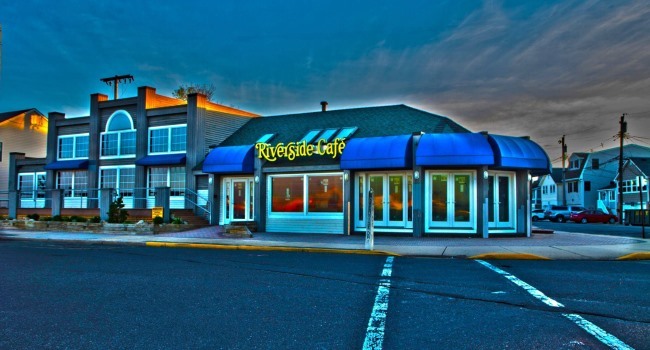 Riverside Café: With outdoor seating and a beach view, it only makes sense that Riverside Café in Manasquan, New Jersey would be dog-friendly. While you and your friends are sipping on your drinks, the dogs can lay by your side and soak up some of the summer sun. 5. Java Dog Café and Tea: This Salem, NJ eatery is a cozy place where you can dine with your pet on the outdoor patio. Although dogs are not permitted inside, during the warmer months patrons and their pooch companions can enjoy their delicious food choices outside. 6. Zoe’s Beachfront Eatery: Located directly on the Cape May, NJ beach, Zoe’s Beachfront Eatery is one of the best-known dog-friendly restaurants in the Southern NJ area. They encourage guests to bring their four-legged friends with them and the staff always looks forward to the animal’s friendly greetings! 7. Witherspoon Grill: This upscale Princeton, NJ restaurant serves delicious American cuisine, has a lively atmosphere where you and your friends can dine and have fun and a seasonal outdoor patio that, when open, welcomes dogs. 8. 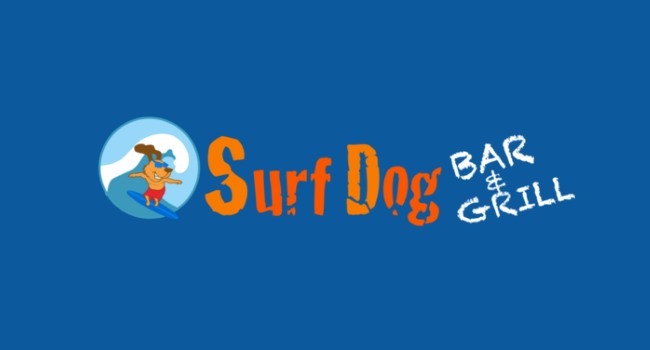 Surf Dog Bar and Grill: This Woodbine, NJ bar is one of Cape May County’s most dog-friendly establishments. They have a fun and casual atmosphere, allow dogs on the patio and have actually been known to allow dogs inside the restaurant on certain occasions! 9. Brick House Tavern and Tap: While this restaurant has a few locations in NJ, it is their South Plainfield location that is dog-friendly, Humans and their pets can dine together on the outdoor patio. 10. 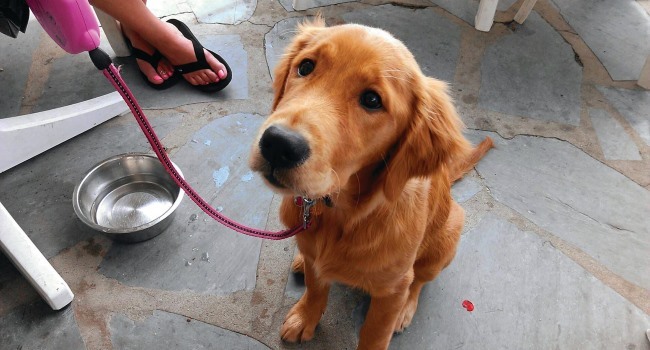 Avenue Bistro Pub: This dog-friendly restaurant is located in Verona, NJ and happily welcomes leashed companions. 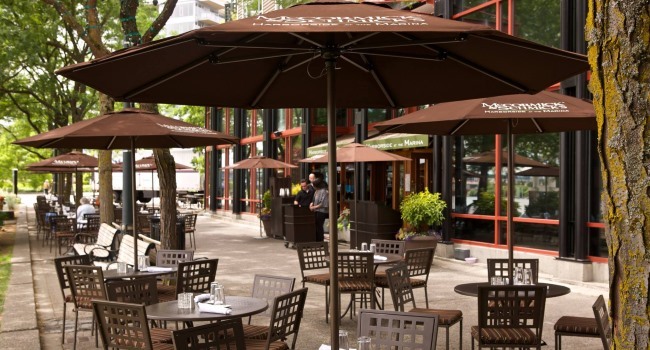 Dine on their outdoor patio for a memorable meal that will make you want to return time and time again. 11. Back Bay Ale House: Atlantic City is undoubtedly one of the most popular cities in NJ and if you happen to be passing through with your dog, Back Bay Ale House will gladly welcome all of you. 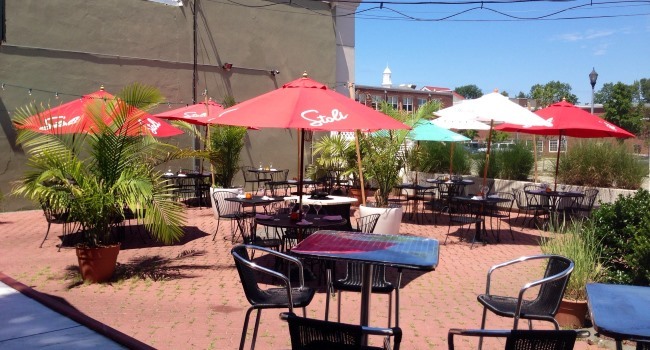 Their outdoor patio is always open to dogs and the staff’s theory is, if it is warm enough for you to be dining outside comfortably, the dog will be comfortable as well. 12. Federici’s Family Restaurant in Freehold: Known to have some of the best thin crust pizza and Italian food in the state, Federici’s Family Restaurant on Main Street in Freehold allows dogs on their patio, as long as they are not sitting directly around the food. 13. Rusty Nail: This Cape May, NJ beach bar has become a legendary hotspot summer destination for locals and tourists alike over the years. Since they have outdoor seating and a casual, friendly environment, it is no surprise that they allow dogs to dine alongside their owners. 14. 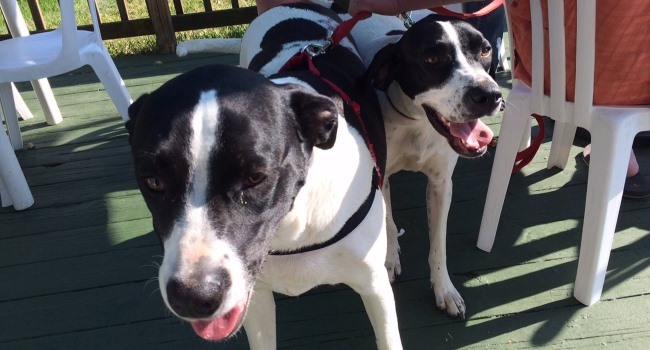 The Bernards Inn: While previously not dog-friendly, as of May, 2015, The Bernards Inn has introduced Yappy Hour events where you can bring your doggie companion with you and wine and dine on the patio during the summer season. 15. The Station: Located in Bernardsville, NJ, The Station is a Somerset County restaurant that has recently begun letting patrons bring their dogs with them to meals. The dogs are allowed in the outdoor seating area and can enjoy the sounds of the live entertainment alongside their owners. 16. McCormack and Schmick’s Seafood and Steak: This Bridgewater, NJ restaurant is an excellent place for people to dine if they love both seafood and enjoying a great meal with their four legged friend in tow! The restaurant serves top-quality seafood dishes and has an outdoor eating area where pooches can sit alongside their owners during happy hour. For the protection of all beloved pets, leashes should be kept in hand and the dogs should not be in attendance on particularly cold evenings or when the patio is closed. 17. Aleathea’s Restaurant: Located at The Inn of Cape May, Aleathea’s Restaurant is a Southern Shore Region dining establishment with an outdoor patio area where dogs are welcome. This restaurant is however, only open on the weekends, serving breakfast on Saturdays and Sundays, lunch on Saturdays from noon – 3pm and dinner Fridays and Saturdays. They also host a happy hour every Friday from 3 – 6pm. 18. 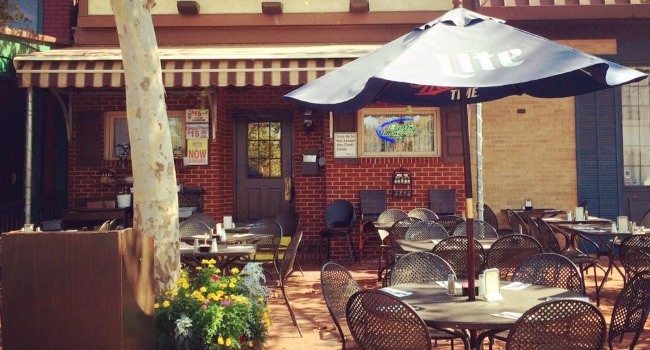 Courtyard on Main: Formerly known as Main Street Bistro, this Freehold, NJ restaurant is a great venue for special events, parties or a simple dinner out with friends, family or a significant other. 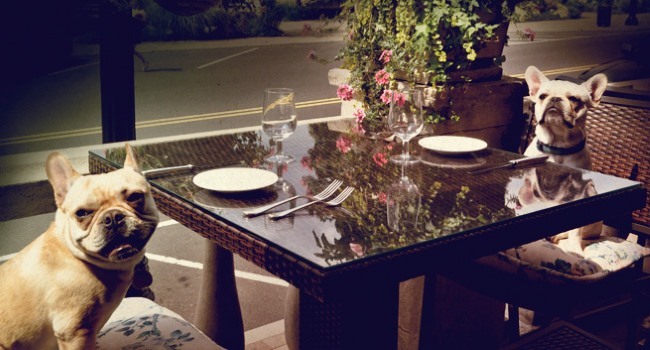 Their outdoor dining area is dog-friendly and open to dogs of various sizes. 19. The Blue Pig Tavern: Another dog friendly restaurant in Cape May, NJ is The Blue Pig Tavern. Serving modern American fare on a regular basis, this restaurant allows dogs on premises during seasonally appropriate times. Maybe it should be called The Blue Dog Tavern! 20. 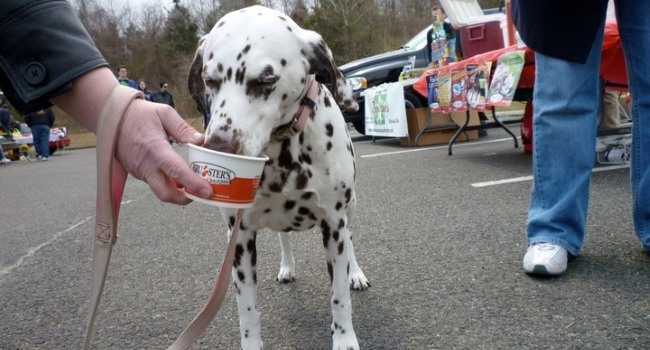 Bruster’s Real Ice Cream: This outdoor eatery in Gloucester County NJ encourages guests to bring their dogs with them for an afternoon of ice cream and fun. Everyone, maybe even your four-legged friend, can enjoy spoonfuls of the best tasting frozen treats in the area! 21. Verve Bistro Bar and Lounge: This restaurant in Somerville, NJ boasts about a gourmet quality food menu, upscale, sophisticated dining room and an outdoor area where patrons who wish to do so, can bring their dogs along for the meal. 22. Boulevard Five 72: This Kenilworth, NJ restaurant has a beautiful architecture, fine dining cuisine and a large outdoor patio where patrons are more than welcome to bring their lovable dogs. 23. Bella Vida Garden Café: With exceptional outdoor seating and a casual, friendly environment, Bella Vida Garden Café in Cape May, NJ is the perfect restaurant to bring your dog to in Cape May County. 24. 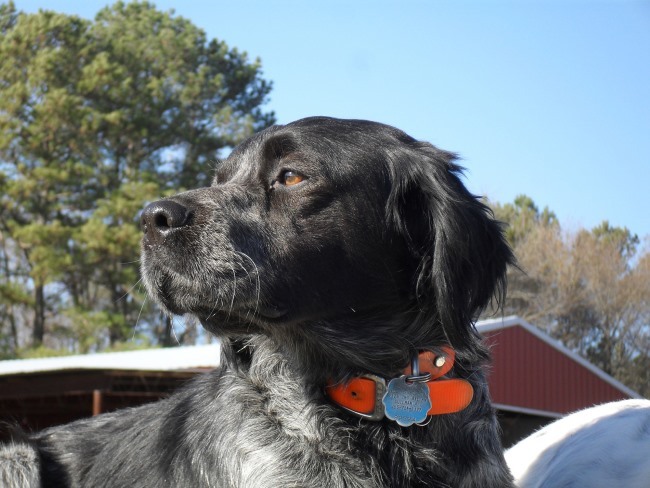 Hawk Haven Vineyard and Winery: Located in Rio Grande, NJ, Hawk Haven Vineyard and Winery may seem like an unlikely restaurant where you can bring your dog, but they do allow dogs on premises. While they recently had to limit the areas in which dogs are permitted, they love seeing guests bring their furball friends in tow. 25. Robin’s Nest Restaurant: This Zagat rated restaurant in Mount Holly, NJ is located along the water. The restaurant features an outdoor seating area that guests of all kinds, humans and dogs alike, can enjoy. 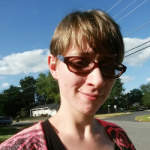 Robin’s Nest Restaurant serves the best French-American cuisine in Burlington County! Would you visit any of these restaurants with your dog? Which one sounds most interesting to you? Let us know in the comments below! If you prefer cats to man best’s friend check out Catsbury Park in Asbury Park, NJ. 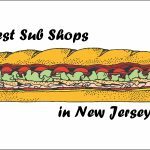 If you don’t have a pet, or you are thinking about dining out and leaving your dog at home, here is a guide to the best restaurants around NJ.